Due Diligence – Australian Building Regulations require that you meet strict requirements so make sure the windows and doors you purchase comply with all the building requirements. There are standards for the way they are constructed as well as the way they are used for your home. Check that they open correctly, have screens or markings to reduce the risk of anyone walking or falling through them and they must fit the structure of your home correctly. Your architect or builder will know the required regulations. The Right Look – Make sure your windows and doors complement your home’s design. When you’ve gone to the expense of building a home or upgrading the appearance of your current home through renovation, why spoil the overall look with the wrong doors and windows? Doors and windows you might choose for a home in Melbourne will differ from those you choose for the weather conditions of Brisbane or Darwin. Make them match! Aluminium doors and windows offer far more flexibility in style and design than other materials and because they are durable, they will look great for much longer. Choose carefully so that your home stands out for the right reasons. Keeping your family safe – you don’t want to regret scrimping on the quality of your aluminium doors and windows if it means that your family’s safety has been put at risk. When it comes to security, windows can be a weak point in your home security. That’s why it’s important to take safety into account when you purchase your doors and windows. There are many options for adding screens and locks to your doors and windows that ensure you can sleep well at night knowing your family is safe. Environmental considerations – Your home needs to be your sanctuary. A place where you and your family can relax. Careful selection in the design and location of your windows and doors can make a huge difference to the amount of light that enters your home and the amount of heat that escapes in winter or heats up your home in summer. With around 87% of ambient heat warming your home through your doors and windows, you need to plan how you can keep your home cool in the hottest months. Of course, aluminium doors and windows are easy to open up to any cooling evening breezes to lower the interior temperature before you start using electricity for fans and air-conditioners. In winter, you can reduce your heating bill significantly by having your doors and windows positioned in alignment with the North/South aspects of your property. The style of your windows, the type of glass they use, glazing and seals all contribute to the way in which your aluminium doors and windows assist in keeping the interior of your home at a comfortable temperature without causing additional costs. Check with your builder or architect to ensure they’ve planned for the best location and style of your security doors and windows. Choose windows and doors correctly – Your home has different rooms where the level of privacy has to be a major consideration. The bathroom is best served by the obscure glass to maintain privacy. Your front entry door is another area where you might consider frosted glass so passersby cannot see into your home. Depending on the location of your home or property, some windows of the home need to allow additional light into so that the interior is not dark and dank. Large sliding doors are great for access to the back yard and bi-fold doors can open up the back of your home to your outdoor entertainment area or pool. Once again, aluminium doors and windows provide the best option for managing these aspects of your home. They are lighter, easier to use and require little maintenance for many years to come. 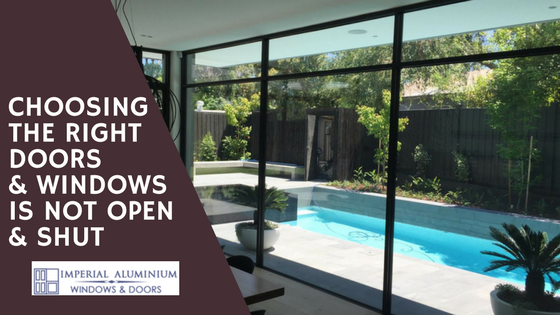 If you’re looking for the right advice for aluminium doors and windows in Melbourne, give Imperial Aluminium a call. We have the experience and expertise working with builders and architects who create different styled homes for their clients. We will advise you to choose doors and windows for your home. Improving the look of your property using Aluminium Doors! Previous Post Why having aluminium doors are a great addition to your home?